“Above there is heaven; below there is Suzhou and Hangzhou”, so goes the popular Chinese saying. And praise doesn’t get much higher than being described as a heaven on earth! Hangzhou is the provincial capital of Zhejiang and rests on the northern banks of the Qiantang River at the head of Hangzhou Bay. The city is connected to a veritable labyrinth of waterways and canals, the most impressive of which is its position at the southern terminus of the Grand Canal. To its east, the magnificent Tianmu Mountains rise up imposingly, while to the west you’ll find the celebrated Xi or “West” Lake. Thus it is a city resplendent with sparkling waters, verdant gardens, misty mountains, colourful blossoms, and a natural freshness that belies its status as an urban metropolis. Its name derives from the fact that in 589 AD, during the Sui Dynasty (581-618), it was made the seat of Hangzhou or the “County of Hang”. This entitled it to a city wall and allowed it to expand exponentially, transforming it from a rural town to a city of political importance. With the completion of the Grand Canal in 609, it became one of the major trade hubs linking northern and southern China. During the Five Dynasties and Ten Kingdoms Period (907-960), it became the capital of the Wuyue Kingdom (907–978) under the name Xifu and rose to prominence as one of the bastions of southern Chinese culture, alongside Nanjing and Chengdu. In 1127, when the rulers of the Song Dynasty (960-1279) were forced south by the invading Jurchens, they settled in Hangzhou and made it their capital in 1132 under the name Ling’an. It was intended to be a temporary base, but it soon transformed into the commercial and cultural centre of China. By 1276, historians estimate that the city’s population had grown to well over one million, making it the largest city in the world at the time. Evidently the word “temporary” doesn’t mean the same thing to us as it did to the Song emperors! In the late 13th century, during the Yuan Dynasty (1271-1368), the city was visited by Venetian explorer Marco Polo, who described it as “the finest and noblest in the world”. So not quite heaven on earth, but still pretty impressive! Unfortunately, from then on it seemed that Hangzhou’s glory days were finally behind it. From the 14th century onwards, Hangzhou Bay gradually silted up and trading in the city slowly ground to a halt. Yet it wasn’t all downhill, as during the Ming (1368-1644) and Qing (1644-1912) dynasties it was still regarded as a superior prefecture and enjoyed immense wealth as one of the country’s centres for rice-growing and sericulture. This quality has carried through to the modern-day, as it is now renowned for its beautifully woven silk tapestries and umbrellas. 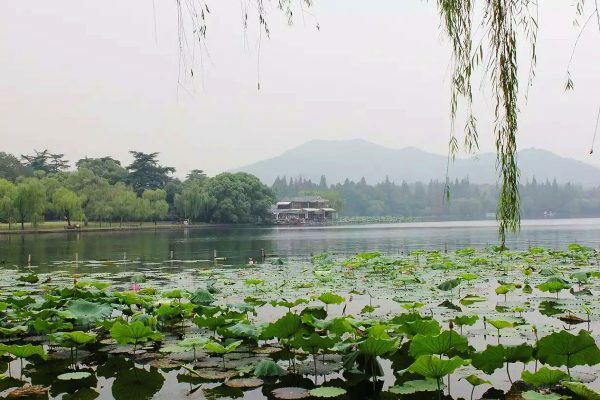 Hangzhou’s illustrious heritage means it boasts some of the country’s most significant historical attractions and has thus become one of the most popular tourist destinations in China. Its most eminent attraction is arguably West Lake, which was made a UNESCO World Heritage Site in 2011. This scenic site covers an area of over 33 square kilometres (13 sq. mi), making it nearly eleven times the size of Central Park in New York! It includes some of the most notable historical buildings in the city, from towering pagodas to ancient causeways. At night, the waters come alive with performances of Impression West Lake, a love story that takes place on the lake itself and was masterminded by acclaimed director Zhang Yimou. Just to the south of West Lake, the imposing five-storey Leifeng Pagoda rises up at the base of Sunset Hill. Its fascinating history stretches all the way back to the Five Dynasties and Ten Kingdoms Period (907-960), when it was built to celebrate the birth of the reigning King Qian Chu’s son. It was supposedly the site of a celebrated Chinese folktale known as Legend of the White Snake, a story about two ill-fated lovers that has inspired Chinese novels, operas, films, and television series for centuries. Yet it seems the pagoda was doomed to suffer a fate as tragic as that of the lovers. During the Ming Dynasty (1368-1644), Japanese pirates set fire to it and destroyed its wooden structure, leaving behind only a brick skeleton. Even the bricks weren’t safe as local people, who believed they had healing properties, would frequently steal them and grind them up into medicine powder. Who needs concrete medical proof when you’ve already got concrete! Tragically this led to the tower collapsing in 1924, but it was reconstructed in 2002 and remains a popular attraction to this day. About 2 kilometres (1.2 mi) west of West Lake lies Lingyin or “Soul’s Retreat” Temple, which is the oldest Buddhist temple in the city and boasts numerous pagodas, murals, and hand-carved grottoes. Other religious sites, such as the Immaculate Conception Cathedral and the Fenghuang or “Phoenix” Mosque, are not only the oldest of their kind in Hangzhou but also some of the oldest in China. With such an impressive historical pedigree, it’s no wonder Hangzhou is home to several museums of national importance. The China National Silk Museum, located not far from West Lake, is the largest silk museum in the world, while the China National Tea Museum focuses entirely on different types of tea, tea culture, and the history of Chinese tea. Hangzhou district is particularly famous for its Longjing or “Dragon Well” green tea, which is cultivated in the small village of Longjing and is admired for its subtle flavour. Purchasing any of these fine goods, from packets of high quality tea to finely embroidered silk umbrellas, can be easily done on Hefang Street. This street was designed after traditional Song Dynasty architecture and is a hotspot for locals and tourists alike. If you want to escape the urban jungle, there are plenty of natural attractions in and around the city. The Qiantang tidal bore, a watery natural phenomenon of epic proportions, can be viewed from the banks of the Qiantang River and, during peak seasons, can reach heights of up to 12 metres (39 ft.)! For a more peaceful aquatic experience, you may want to consider visiting Xixi National Wetland Park, which is a haven for numerous species of birds and fish. That being said, it is a conservation area so don’t try to eat any of them, no matter how plump and juicy they may look! The Grand Canal: It is the longest canal in the world and starts in Beijing, passing through the provinces of Hebei, Shandong, Jiangsu, and Zhejiang before eventually terminating in the city of Hangzhou. It links the Yellow River to the Yangtze River and the oldest parts of it date back to the 5th century BC, although most of its construction took place during the Sui Dynasty (581-618).